Machine defeats man in Diesel Combat! See shocking article! Bladder Grabber pre-contest quiz: Match the quote to the flier and win a prize! A View from Broadway: Why do we pay club dues? All CL fliers invited to "A Toast to Frank Boden"
F2D shutoff controversy: Blame Jeff Day! Bod Busters attacked by aliens! Bod Busters clone Don McKay! News flash: Mike Rule joins BBB! One of the Northwest's control-line competition teams, which began in the Seattle area in the 1960s, was reconstituted and modernized in 2007. Bod Busters seen at the 2008 Jim Walker Memorial in Portland are (from left) are Ken Burdick, Jeff Rein, Don McKay and Buzz Wilson, Jeff Rein and Ken Burdick. They're shown with their F2D Proto aircraft. Flying Lines photo. Once upon a time, (don't you just love that beginning?) 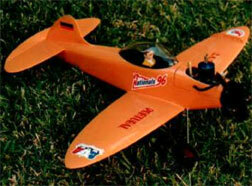 there was a group of inner -city kids in Seattle who started a model airplane club named The Broadway Bod Busters. The Bod Busters got their name from me, Ken Burdick. We all gave it names but this one stuck to the wall and kept coming back like the buzzards to Hinckley. "Bod" was a popular slang used by Lan Roberts, a famous AM Disk Jockey in the 60's. Our sponsor was a hobby shop on "Broadway" avenue at the north end of Capitol Hill. "Busters" because we broke most all our stuff flying combat, and it made a great double entendre. Like so many things of that era, life was smaller and slower than today, all of us learned by doing, and making numerous mistakes in the process. We tried to have contests like we read about in magazines and really had no idea anyone else did this stuff in the Seattle area, getting a copy of the AMA rule book was a revelation. We later discovered that there were indeed others and an even better discovery was a AAA contest located at the naval air base (Sand Point). We went to watch and came back full of new ideas and a bag filled with phone numbers of people that we considered experts. Notably was the group from Beacon Hill the "Seattle Air Knockers" they helped us learn then dominated us for several years after that. What doesn't kill you makes you stronger, right? Bob Carver was no club member but was a force to be reckoned with and unbeatable in combat back then. He would scare away the older Skyraiders by doing 100 mph squares a few feet off the deck using old red silk Voodoos with the engine set way back in the wing and home-made long booms. The list of flyers better than us was enormous and the only wins we got came at great personal effort. Some of the locals that I remember include Haverly, Helmick, Carver, Shephard brothers, Eugene Woo, Dave Curly, Bob Tuggle and even Henry Nelson! All combat flyers, and all good. Thankfully all of them and more were in the senior or open division so I didn't have to fly against them. The following year reality hit and we began to fly all ages combined. In those days combat contests were single-elimination, it took three years before I earned my first trophy, a hard fought third in open rat race, followed by a third in "combat" -- there was only one official combat event then. There is always one mentor and the Air Knockers had such a person, Gary Yamamoto, everyone's big brother. He showed us how to hop up engines, how to "call Garcia" at Hi-Johnson and sweet talk him into picking out the best engines and sell them to us, how to work as a team and all help build a combat ship in one night. A Master craftsman even as a kid, Gary led by example, we were occasionally winning and making inroads to their grip. The Bod Busters grew and became a regular club. We, however, didn't much like one another so meetings were more brawl like than Robert's rules of order, but we did put on contests. Combat, rat race and an occasional speed meets, all before the age of 16. No one had a car so we took the bus, walked, or asked for rides. We divided up the work such as going to hobby shops and begging prizes for contests, making rope barriers and cutting streamers. The club began to attract some adults who were helpful in getting to and from events and, though we were skeptical, we soon discovered that some "old guy's" also could be interesting and had real organizational skills! They introduced us to better building ideas and we introduced them to new ideas. Our sponsor only provided a meeting place for the club, but the owner's husband would load us all up in the 1950 GMC panel truck and drive us to Albany, Ore.,where the pre-runner of the NW Regionals got its start. Ken Kincaid (co-owner of the hobby shop), children grown and out in the world, drove countless hours and miles with a load of kids. We never understood why but it was as fun for him as it was for us, he knew our parents and became one of the fabrics of the club in those days. We built him a rat racer that collectively won more than all the rest of us put together. Don would fly it, Ken would jump in front of it with his cowboy boots to stop the old "Texas Rat" and I would start the gold Fox .40. It was painted orange, Ken smoked stinky cigars and life was more fun for it. The Bod Busters had some core members such as Don McKay and me. He was older and much louder than the rest of us, but we all learned a great deal of competitive spirit from Don. He would try to win in most any way possible within the rules. If the rules were not specific then you could count on an argument for long periods of time. 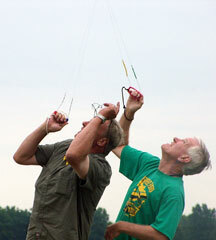 As a Bod Buster, Don McKay broke the balloon bust record at the VGMC contest tied to the Canadian Nationals. He did it by entering Ken's orange rat racer and flying through the barriers instead of over them. They tried to disqualify him but after an hour could not show where it said you had to go over the barrier. Entered rat racers in B speed and C speed (engine change). 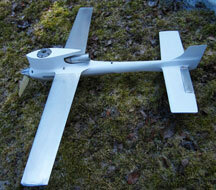 Made the first helicopter entered at the Boeing Scholarship contest (mounted a Baby Bee onto a body and it flew away). Don was a target and some waited for him to fail. He once crashed a new carrier ship with a new Rossi 60. The old carrier guard in Oregon laughed at him and I could see the slow burn going on with him. For some reason he had brought a gallon of fiberglass and spent the afternoon putting the Gruman Gardian back together, winning first with it. In 1967 we dissolved the club but Don and I kept it alive by forming a "competition team." No dues, meetings and all the other stuff we didn't like ... just plain old going for the gold ... bowling trophies by the box full. Back in those days we all had the Military draft to think about, I came up with another to keep the team growing. Our motto was, "If you can't beat them..draft them" and so we did. Some have passed on, most don't think about it anymore, but in the days of clubs and teams the Bod Busters held their own and then some. We were too busy doing it to think about what people thought about us, we were loud and arrogan tbut usually backed it up with the wins. In high school we put up the huge sum of $100.00 for first place in a combat contest, 1966? And drew all the hot-dogs from the Bay area. Beat every one of them with kills and McKay won the money. Jeff Rein and I were talking the other day when he told me that he had always wanted to be a Bod Buster. As a kid, he had done the correct thing and joined the Seattle Skyraiders, to learn find others who could help and all the other reasons for joining a club. Jeff remembers they told him not to have anything to do with the Bod Busters because we weren't "a real club" No dues ... no meetings, just plain bad seed. Jeff didn't like meetings and as you know is a combat flyer with a twitchy trigger finger. I remember a conversation once with Don McKay years ago about some guy flying a combat wing off of the trestle in Bellevue. "We should have drafted him" I said, but this was after the Bod Busters had stopped the team, we just thought it was Bod Buster worthy. I suppose birds of a feather do flock together, so for good, bad or otherwise I have started up the team once again with a new and improved core group. Due to the obvious nature of Jeff Rein (Combat expert), Past Nationals Carrier and Combat champion, stunt enthusiast and budding Clown racing pilot, and Buzz Wilson (Racing Lawyer and Combat expert) FF and stunt enthusiast, we have raised the banner of the old Bod Busters once again. The new team colors are Navy Blue with yellow lettering. The initiation afforded to all new members took place at our new headquarters "Stars" In Beaverton Oregon. This is where new members are sworn in, the agenda discussed, T-shirts handed out and any team issues discussed. In true Bod Buster fashion the history of the club stripped away old ideas like clothing on a hot day bonding the new members together with a forward looking mind-set. We made a Bod Buster entrance at the Warm up in Portland April 21st, 2007. Some of the new events planned for the Bod Busters this year include Speed, more stunt, and maybe some FF. Stay tuned for the next exciting report from the Bod Busters.